“Contradictions” is now open and features a diverse grouping of contemporary artists that are earning a variety of press, including featured artist Richard Bassett. Richard Bassett, in kind thanks to the Jack Fischer Gallery in San Francisco, presents two pieces from his Comfort Level series. Richard Basett describes, “The Comfort Level Series uses anonymous images from bank robberies and convenience store hold ups. 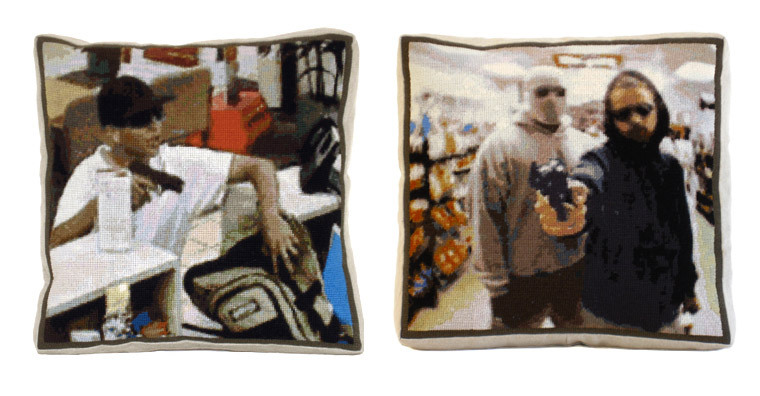 Seen rendered in needlepoint on the face of small pillows, these images are a shock that remind us both of the violence of the original events, as well as their prevalence on the 24-hour news cycle. These pillows suggest that we maintain our distance from the numbing inundation of this type of exposure. Richard Bassett’s Comfort Level art pieces are now on exhibit. Please visit “Contradictions” through November 5, 2011. 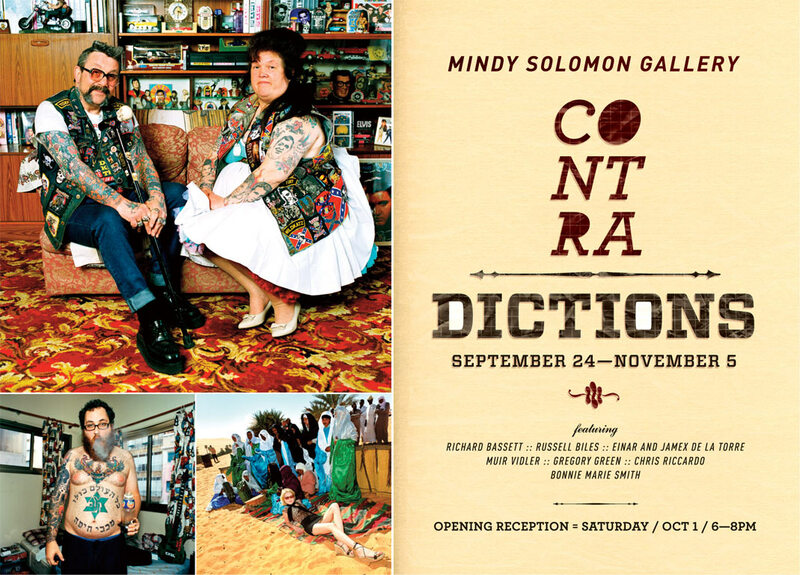 Mindy Solomon Gallery is pleased to introduce a provocative showcase of eight contemporaries in a themed exhibition entitled, “Contradictions.” Taking a close look at worldly themes and opposing viewpoints, “Contradictions” allows each artist to freely explore life’s nuances through the lens of humor and irony. 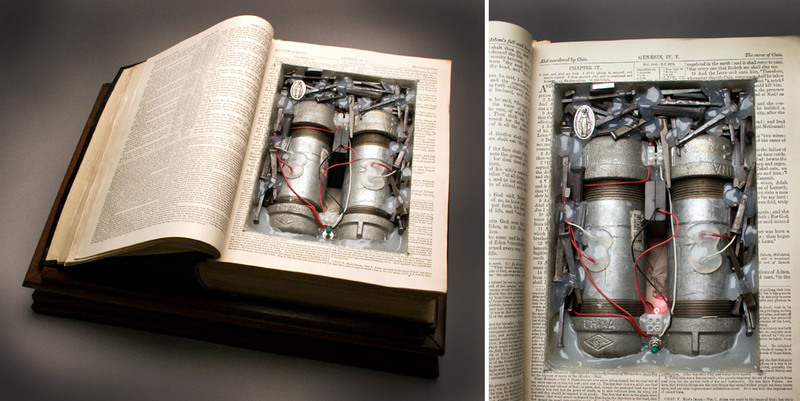 “Contradictions” will be on exhibit September 24—November 5, 2011 with artist talk with Russell Biles on Saturday, September 24, 12—2PM and opening reception on Saturday, October 1 from 6—8PM. (Please join our guest list). Richard Bassett presents two needlepoint pillows to represent the over sensationalism of visual violence, the dulling of our senses as a result, and our ambivalent response. “And, can the shock of seeing these images on pillows momentarily snap us back to their reality?” Courtesy of the Jack Fischer Gallery in San Francisco. 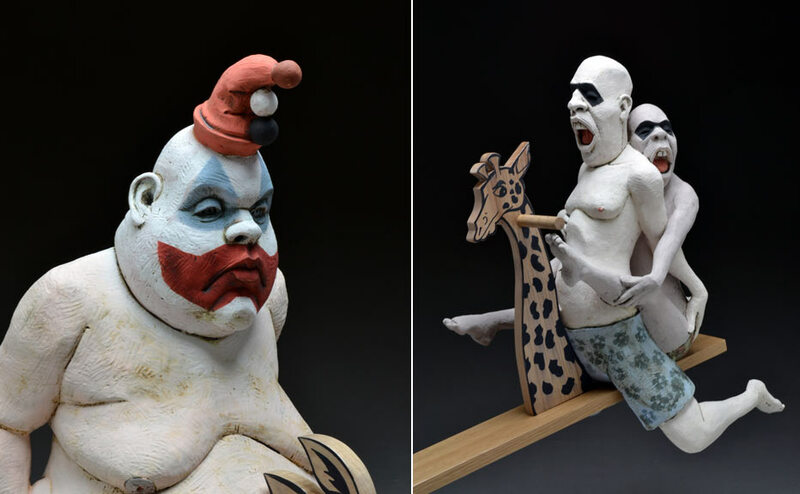 Russell Biles works in porcelain crafting figurations that explore race, politics and sexuality. 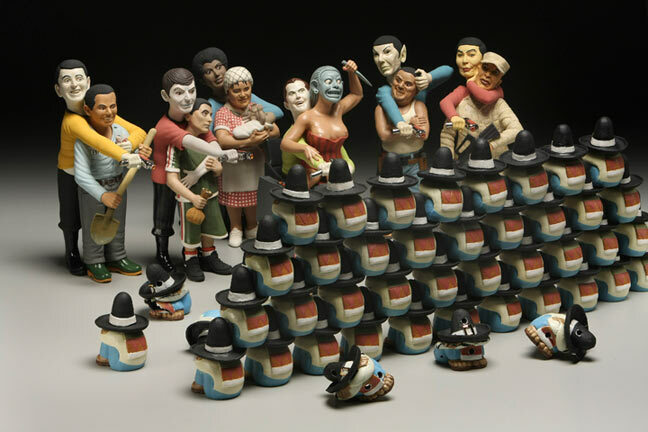 Biles’ sculptures provide humor and commentary about subjects that are often difficult to discuss. 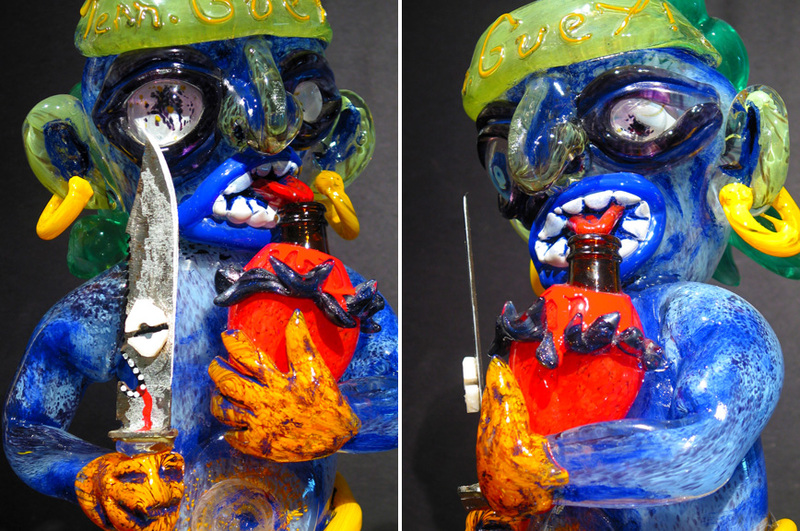 Einar and Jamex de la Torre work in hot glass and mixed media to create spirited sculptures that disrespect cultural and religious institutions. The combination of such enlightened narratives form a strong and thought provoking exhibition that both will repel and fascinate the viewer. Muir Vidler travels the world utilizing a camera to capture cultural ironies. His narrative photographs travel the world and satirical in nature. He explores the contradictory nature of his subjects versus the environments in which they live in order to document the way in which unique individuals define themselves in even the most oppressive of conditions. Chris Riccardo utilizes the language of scale and form to address serious societal concerns in his sculpture Consequences. He comments on the epidemic of childhood obesity in our country and how the disease affects our children’s ability to play, leading to low-self esteem, inability to interact and work with others and possible future psychological abnormalities.